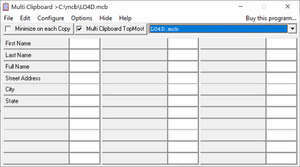 Multi Clipboard is a shareware clipboard replacement program with updated support for newer versions of Windows including Windows 7. Multi Clipboard supports copy and paste of over 10,000 characters and fits nicely in with multiple copy and paste operations with just one click of the mouse. For security reasons, you should also check out the Multi Clipboard download at LO4D.com which includes virus and malware tests. Additional screenshots of this application download may be available, too. If you've ever worked with the Windows clipboard, you would know it is not at all versatile. In this category, we explore some of the programs used to increase clipboard functionality. Check out some of the freeware downloads available in the clipboard program category. They contain no strings and are available at zero cost.